The jasmine is clearly evident here, but sadly, no passionfruit, though there is a vague fruitiness. A fairly boring tea, though it’s not bad. I’m baaaack! Sorry for the mini-hiatus, but packing for Rome was so stressful (it was my first time travelling alone-ish) and took up so much time that I didn’t have time to drink tea, let alone write about it. This was the only tea that I drank in the last couple of days leading up to the trip, and I drank coffee – mainly espresso – the whole time we were there and haven’t had any more in the day since I got back, so this is the only note I have to catch up on. Sadly I don’t remember the finer details of this tea (it was a sample from my swap with VariaTEA so it’s not one I’ve drank often), only that it was nice, but definitely underwhelming and more peppery than a ‘butterscotch’ tea should be. I didn’t get the alcohol comparisons, to me this was more of a peppery caramel white tea. The sweet buttery note definitely came across more as caramel to me than it did butterscotch, which used to be my brother and I’s favourite dessert as kids. I suppose that distinct memory could be what’s preventing me from making the connection here. Still, I’m grateful to have tried it. Also, if anyone’s wondering, Rome was incredible, stunning, moving, immense and I’d go back in a heartbeat (we’re planning a potential second holiday there later this year!) I’d recommend it to anyone that’s considered going, and anyone that hasn’t. I have to assume that the sample I have is of this tea, as there are no others with the same name. Sadly, not really enthralled with this one. Either it has lost a bunch of flavour, or wasn’t great to begin with. I did oversteep, so it was astringent, but I really couldn’t pick out much flavour. I have a few more cups’ worth to check if I can get anything out of a properly-steeped cup, but I don’t have high hopes. ’There’s a Chinese place in my town named Lychee, and when I rent to try/review this tea, I suddenly realized I had no idea what a lychee even was. Anyway, this one intrigued me because I don’t think I’ve tried a white chai before…or come across one, even. Usually I’d cool the water quite substantially for a white tea, but the parameters for this one recommend 195 degrees so that’s what I went with. I used 1 tsp of leaf, and left it approximately 2.5 minutes. The resulting liquor is a medium yellow-orange, the scent mildly spicy. To taste, it’s definitely the most interesting chai blend I’ve tried in a while. It’s fruity, first up, and quite tropically fruity at that – pineapple, coconut, a background hint of citrus. There’s also apple, and it’s a baked apple kind of vibe that I’m getting. Sweet, mushy…paired with the spices, it’s putting me in mind of apple pie! The spices are the other side to the coin here. On the one hand there’s fruit, and then from the mid-sip onwards it’s all about the spicing. Ginger and cinnamon are the most prominent, but there’s also a good strong hit of pepper (which I adore in a chai), plenty of cardamon, and a touch of clove. The white tea, which is the truly unique thing here, makes for a better base than I expected, in all honesty. It’s not thin or particularly sweet – it’s more of a thick, almost slightly dusty-tasting white. It allows both the fruit and the spices to shine without being particularly obtrusive, and it works well enough with both that it’s not a jarring contrast. It doesn’t feel like a tea of two halves – it tastes like it was meant to be, and I think the choice of base helps with that in a way that’s hard to express in words. It has to be tasted to be believed. Highly recommended for all chai fans! I’m not going to have to worry about teas sitting in the hot mailbox all summer… because I’m vowing not to acquire any more teas all summer! It’s been a little overboard lately, even if I appreciate them anyway. This is a white tea? Huh, I probably overbrewed this then, but even if I did the tea is not bad. The coconut lends a slight creaminess rather than a nuttiness to the tea. The base is rather light, which considering it is a white tea, makes sense. I don’t have too much experience with white teas, so I can’t judge. Let this cool a bit before drinking it, it has a short of weird tangy sour note when it’s still hot, like sour yogurt, but that mostly goes away when the tea has cooled. The urge to drink Pu’erh comes and goes with me, perhaps largely because I initially found it a very acquired taste. Even though I’ve now tried a significant variety of different Pu’erhs, I still feel that I’m learning about the variety and discovering new things. This tea, for instance. I’ve never tried a floral Pu’erh before, or any variety flavoured with honeysuckle, come to that. It’s a real first! Lovely creamy yet floral perfumy aroma as it steeps! Tastes just as it smells. I think I actually like this without any additions! Perfectly balanced and creamy earl grey. A nice creamy earl grey is hard to find. Four for you Persimmon Tea Co. You go Persimmon Tea Co. This tea is about what i expected… pretty good. I have given up on some of the expectations I have when it says words like ‘Crisp" or “cobbler”. The flavor is good solid black tea with the fruitiness of peach and apple. I didn’t sense hibiscus which is good since I don’t enjoy hibiscus very much. The fruit flavors could have been a bit stronger but it remains a pleasant tea. Thanks to MissB for passing some down in my parcel! With the crazy amount of ingredients in this, I was expecting something very complex but it ends up being quite straight-forward cinnamon and fennel, with maybe a vague echinacea undertone. I didn’t even realize that The Persimmon Tree Tea Company offered a black lychee tea, but I was certainly excited to learn that they do and be able to try it. The last black lychee tea I fell in love with, The Tea of Kings, was from RiverTea so I can’t buy it anymore. I need a solid replacement. My initial thoughts about this cold brew are that the flavor level of the lychee and black base are pretty equal, which is how I feel it should be. The black base is brisk, clean and full bodied with malty notes and slightly more floral notes. It reminds me vaguely of a high grown Ceylon? The lychee is juicy and realistic and doesn’t taste overly floral or chemical which is a trap that flavour often falls into with lower quality lychee teas. I taste the pear notes a little too, but they’re fairly flat and certainly not the focal point of the blend. I don’t think this is my new lychee black to keep on hand, but it’s definitely one of the better ones I’ve had the pleasure of tasting. Thank you TeaNTees! Just added this one to my wish list! Oops – I meant to post this under your Zomba Pearls review! Is Persimmon Tree Tea still in business? Their website hasn’t been working for quite some time. @Lindsay, I have not! LP recommended them too; they’re on my wishlist already – I just can’t afford a Tealux order atm. When I think of “Gold” in relation to “Assam”, I’m usually thinking of “Golden Lion” varieties where the leaves really are golden-brown in colour, frequently accompanied by what I think of as “lots of golden dust”, a little like the grey/white dust that white tea sometimes exudes. This Assam clearly isn’t one of those – the leaves here are mostly a black/brown colour, with the odd golden-tipped leaf. This was the tea that I cold brewed for the iced tea event that I attended last month. Not only is this tea balanced wonderfully, its cold steeped liquid is the second best cold tea I have ever had. The tea on its own is naturally sweet with a scent that is light enough to not be annoying, but fruity enough that the smell comes before the taste. This is the kind of tea that I will showcase during summer because its semi-juicy and sweet taste is perfect for when its hot outside. First, my apologies to K S, who graciously shared a bit ages ago, and I have been remiss in expressing my thanks…because this is tasty! It also holds up well to mistreatment (the baggie got wedged behind a couple of tins and I didn’t know it was there). I don’t do Darjeeling often, so when I do, I’m pleasantly surprised. This particular variety is one of the “grapiest” Darjeelings I’ve tried; after half a cup, my mouth feels like I’ve had fruit juice. It has a …mmm, not delicate, maybe elegant or refined personality and would, no doubt, taste better from Grandma’s teacups than my battered Tervis tumbler that has suddenly started to behave like a dribble glass. Whew, I’m relieved to see elegant and KS did not occur it in the same paragraph. Barbarian, yes. Refined not so much. ha. Sadly it appears The Persimmon Tree may have given up. They are/were one of the few companies I felt did flavored teas well. I like subtle flavored teas – exception is my beloved EG which must be bold and have an edge. Anyway glad you found this and enjoyed. I don’t have an elegant bone in my rapidly aging body. Maybe that’s why I don’t drink Darjeeling much. Inferiority complex. I noticed there is now an On Hiatus note on the home page. Hope they are back in action soon. Another reviewer said that this is the much better version of that not so great teabag tea you grew up drinking, and that is spot on. This is a very smooth black tea. It’s sweet, malty, not overly tanniny, and generally a pleasant way to start a morning if you’re just looking for a caffeine boost from plain black tea that isn’t trying to be anything other than that. I’ve had this tea for a while, and I think something was off with my set up, because every tea I tried had a weird soapy flavor that it no longer has. A friend stopped for the night at my place last night in the midst of his move to Boston and I offered tea. I took a chance on this instead of Yunnan White Jasmine (though I knew that would be a winner) because I wanted to show my guests an awesome unflavored tea, and I was hoping this would do. Long story short, it was by far the best steeping I’ve gotten out of this tea, enough that I now feel comfortable giving it a relatively high rating. 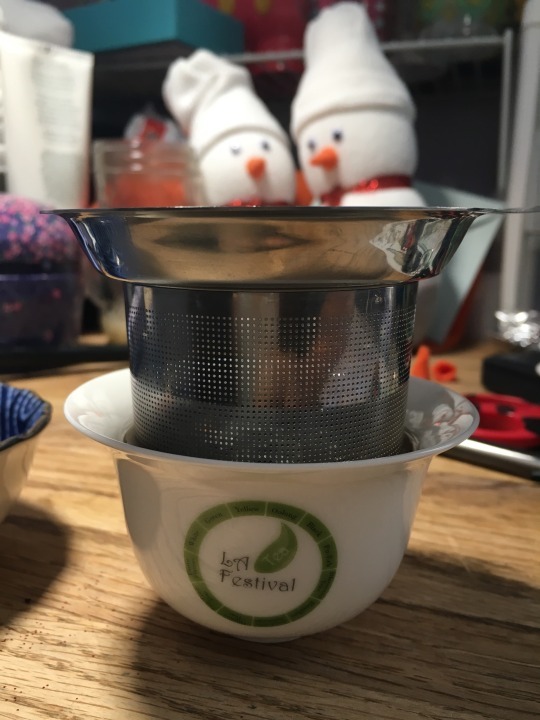 For my future reference, I filled my travel gaiwan about a third full with leaves, heated water to 195 degrees and just kept brewing from the same kettle as it cooled. I started with a 5 seconds steep that was more of a rinse, and the flavor was barely there, just a hint of sweet florals. I had to coax my friend’s moving buddy to have a second cup, but after the second steep he kept holding out his cup for more! I also used the aroma cup set and it greatly enhanced the experience! I increased my steeps by 5 seconds each time for a total of five steeps, the last of which was severly degraded, both in flavor and scent. The second steep was much more nectar sweet and full of high florals and very strongly floral in the nose. The third steep was even sweeter smelling, but the flavor was a little greener, with a little more body and a switch to a more stately rock sugar sweetness. The fourth steep was when you could tell it was going down hill. The aroma cup was still full of sweet spring air, but the flavor was much flatter and a tad greener. The last steep was a weaker version of the fourth steep in flavor and smell. Overall, this is the best tea I’ve gotten for the amount I paid (50% off sale!) and I’m glad to have it in my cupboard! I’m not going to rate this just yet, because I’m not confident yet in my home brewing setup, even though I have already had this twice. Brewed gong fu style in my new lotus themed ru kiln travel set (which I absolutely adore, by the way). I used about two heaping teaspoons (around 3 g, maybe, my scale is for big things! ), and I measure the gaiwan at 120 ml (4 oz) full up to the brim, but the cup only has 60 ml, and all but the first two steeps usually fit in it. The rinse tasted like minerally water, I think I steeped a total of 4 times starting with 10 seconds and going up 5 seconds each steep. The set keeps the tea really hot, so I had to wait a while to get any flavors out, but even then they were light. It was like very faintly floral hot water with unfiltered honey in it. Maybe I’m just not in the mood for plain sweet teas, but this one and the milk oolong I had last week just struck me a purely sweet, with not much else going on. I think I may actually be getting tired of unflavored oolongs, because that is like 90% of what I’ve been drinking lately. Western style in my new tiny 6 oz yellow teacup that I got a goodwill (and there were two, so one for home and one for the office!). Two 3 minute steeps, the first of which was more honey and the second of which had a slightly stronger floral and less sweet flavor than when I brewed this tea gong fu. I still think I’m doing something wrong with this tea. It may just be that I’m not in the mood? Smell: Picture yourself outside on a chilly night surrounding a campfire with friends. Breathe in the air and you’ll get something similar to this tea’s scent. Much like a campfire, the smokiness aroma really hits you. It’s quite intense. I would recommend steeping this tea for the first time in an open area since the aroma may be overpowering compared to other teas you’re used to. Taste: What makes this tea so unique is that the tea leaves have actually been smoked over pine needles. This is what gives it the very bold, but soothing, earthy flavour. The scent alone kept me away from trying this tea for a while probably because it was too heavy for my liking. I’m happy to say the tea itself is actually not bad. After steeping, you are left with a caramel brown type liquid. I have noticed that if you steep it a bit less, the woodsy flavour is more enjoyable as it is not has strong. A pine smoke flavour is quite predominant and I even get a hint of a bacon taste. I do not hate Lapsang Souchong but I think it would take some time before I can actually enjoy it as a beverage alone. What I do love is using Lapsang Souchong for baking or cooking! I think it has become one of my most favourite teas to use in the kitchen as I believe it is something easy to work with. I also imagine that is tea would be ideal for cheese pairing. Hello smoked cheddar…mmmmm. I had heard so much about this tea for a while that I just had to give it a try. I do not regret that I did. While this tea might not be for everyone I think it’s one that needs to be tried (at least once) by all. Smell: To put it simple, this tisane smells just what is is—seeds. The fennel seeds are quite strong in this aroma until you steep the tisane. Once steeped, the liquid is gold and the coriander seed scent begins to shine with a nice earthy aroma. Taste: This tisane is a soothing and healing blend with citrusy notes. There is a mild spice kick during some sips but nothing too strong to be able to compare it to a chai. When I first requested this tisane I didn’t read the full list of ingredients until it came to my door. I saw organic dandelion root and got excited to order right away. I’m not a huge fan of fennel seeds and so I probably would have rated this tisane higher if it was without. I prepared this tea with no additives at first but tried it with some of The Persimmon Tree’s rock sugar the second time around and enjoyed it much better then as I felt the rock sugar helped control the overdose of fennel seeds I thought I was getting. However, the most prominent flavour in this blend for me was the coriander seed (the leaf of this seed’s plant is known as cilantro). All of the ingredients are organic and include health promoting properties especially when it comes to aiding in digestion to heal stomach pains. I would highly suggest this tisane as the perfect drink for after a large meal (ie. Thanksgiving or Christmas dinner) as it stays true to its name. Brewed a cup of Green Caramel this morning. The dry leaf scent is sweet caramel and you can see the pieces of caramel mixed it. Brewed up, I was disappointed with the taste.. I felt that the rooibos taste came through much more than the caramel or green tea taste and threw off the balance.. This rates as a “meh..” on the taste-o-meter™. Another vanilla infused tea, another note about how too much vanilla can overpower the tea flavor. I’m glad they chose a green tea as a base, since I couldn’t really taste the green tea. It seems that a more robust base would hold up to a strong flavor like this. I also really couldn’t taste any of the anise flavor that was supposed to be in there. Don’t get me wrong – I like the tea. I love vanilla. I just kinda wanted something more complex from this cup.